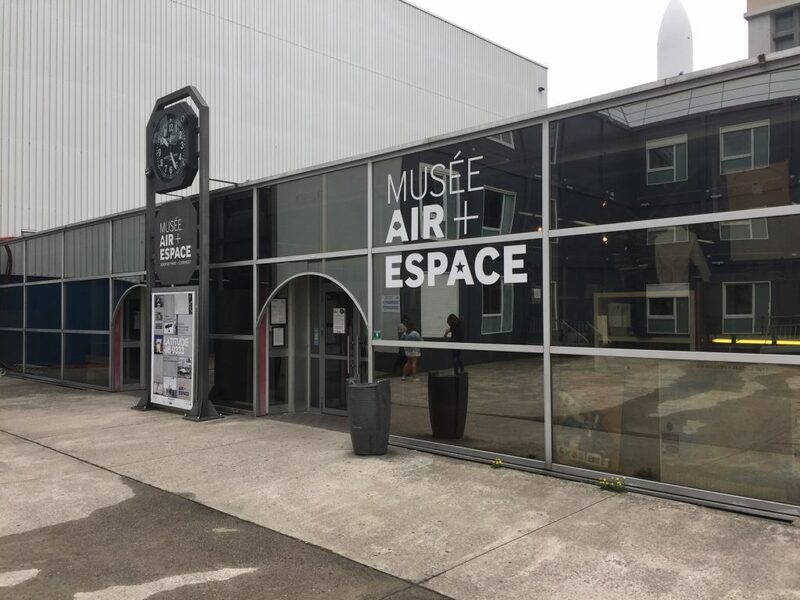 The Musee de l’air et de l’espace, or the Paris Le Bourget Air and Space Museum, is one of France’s premier aviation museums, set in its most historic airport close to the city and other airports. 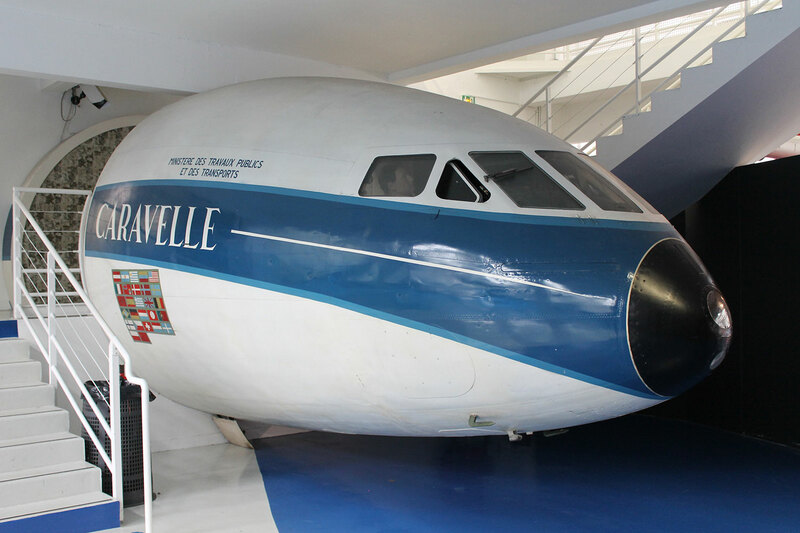 On a recent visit to Paris I stopped by to check out the exhibits on offer for aviation enthusiasts. Le Bourget was, alongside Orly, one of the main airports in Paris until the newer Charles de Gaulle opened in 1974. 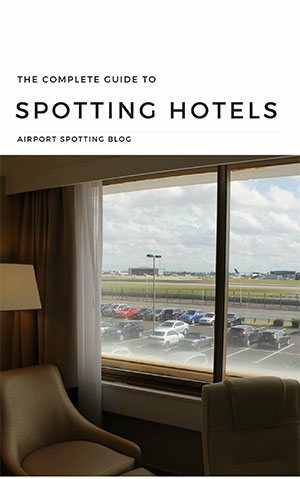 Its small Art Deco terminal played host to a daily influx of airliners from across Europe and further afield, particularly through the crossover period between the piston and jet ages. Today the terminal building still exists and is undergoing a refit to allow its continued use as an event space. 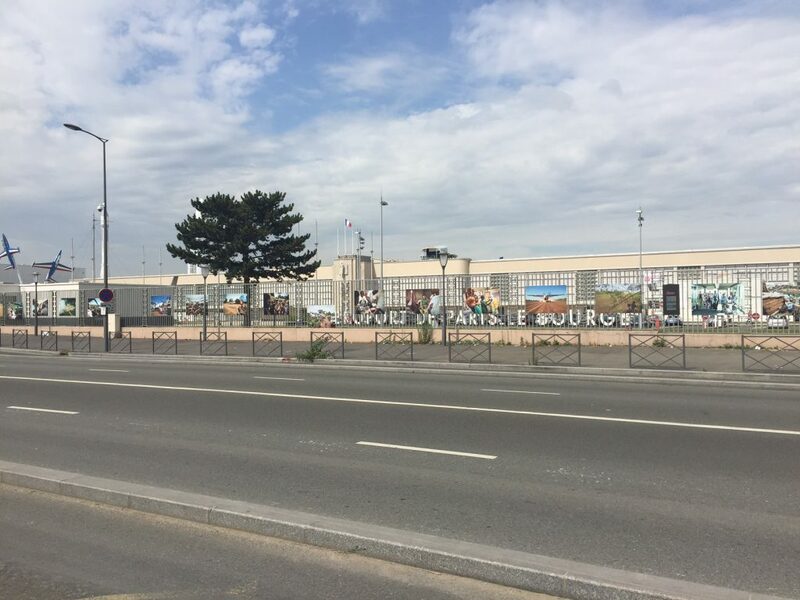 It seems incredible that the main road, running through this suburb of northern Paris, is only a few metres from the terminal – an indication of its unsuitability at developing into a true modern gateway to the city. The museum is located alongside the terminal. Once the admission ticket is bought, there are a series of display halls leading one into another through a row of hangers. Starting with important objects relating to France and Europe’s forays into space exploration, the next hall is home to a selection of significant historical aircraft, including a Junkers F13, DH.89 Dragon Rapide, Farman Goliath fuselage and C-47 cockpit. The next halls cover many prototype helicopters and military jet aircraft, including a range of Dassault Mirage and Mystere fighters and bombers, and the cockpit of prototype SE.210 Caravelle cockpit of F-BHHI. Leading outside another standalone display hall houses relics of World War II, including a Spitfire and immaculate Douglas C-47 transport. 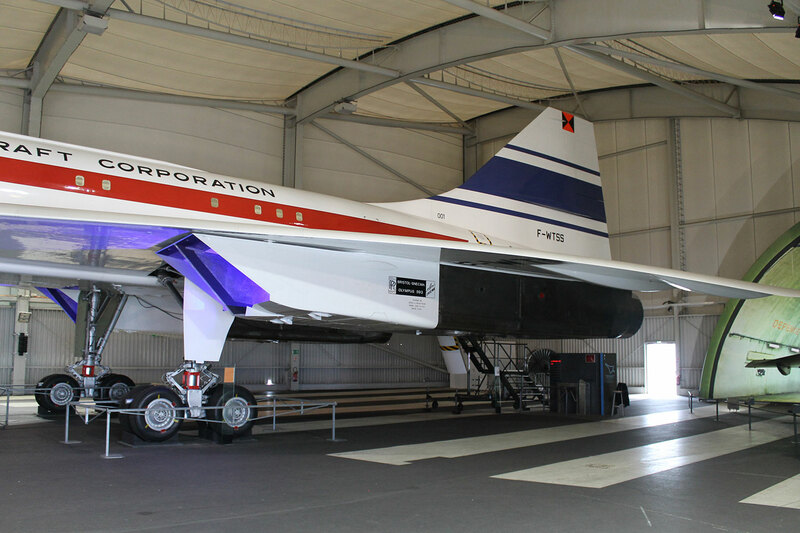 Another hall is home to the museum’s star attractions – two Concorde aircraft parked nose-to-nose. 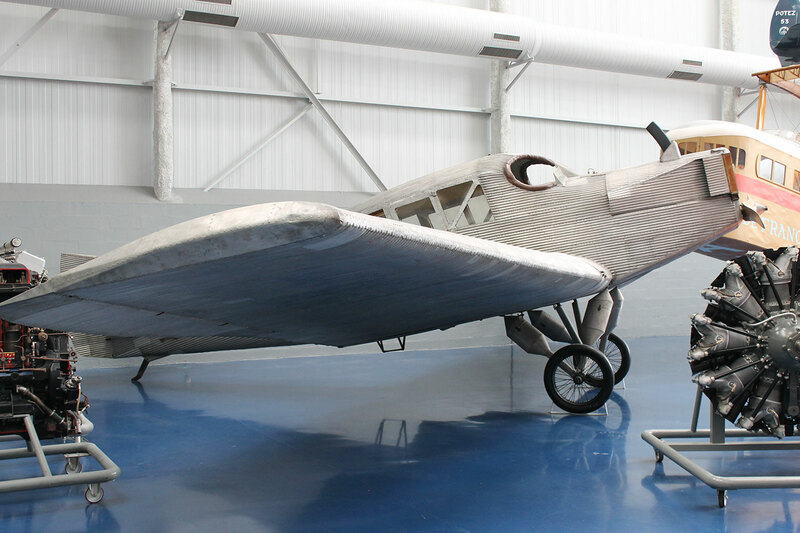 These are the first prototype to fly, F-WTSS, and an Air France example, F-BTSD. 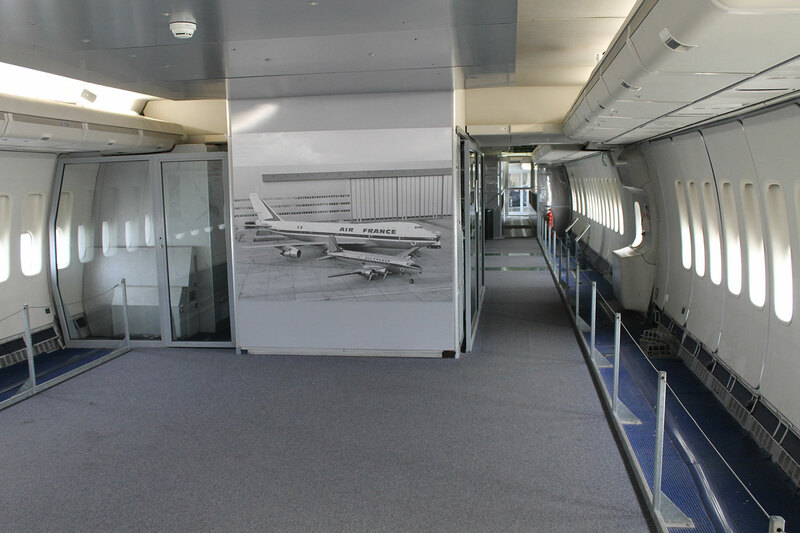 Mounting stairs into the rear of the prototype, you can then walk through its cabin, admire the test equipment on board, and then cross into the cabin of the Air France example which is just as the airline left it, before descending back to the hall’s floor. 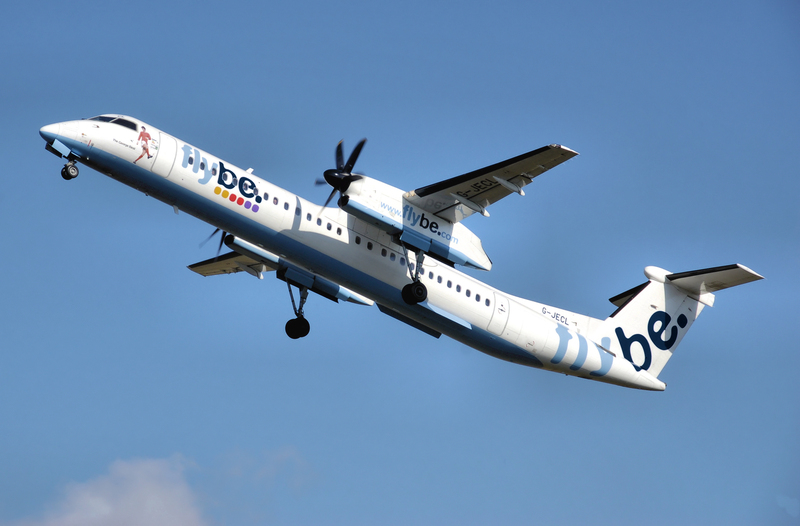 Outside the museum displays its other large aircraft – mostly civilian types which are too big to fit in any available hangar. 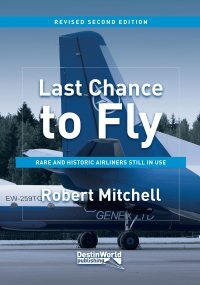 These are all relics of the aviation transport history of France, and include Douglas DC-8 F-BIUZ of the French Air Force, Dassault Mercure F-BTTD of Air Inter, a water-dropping Canadair CL-215, and air force C-160 Transall. 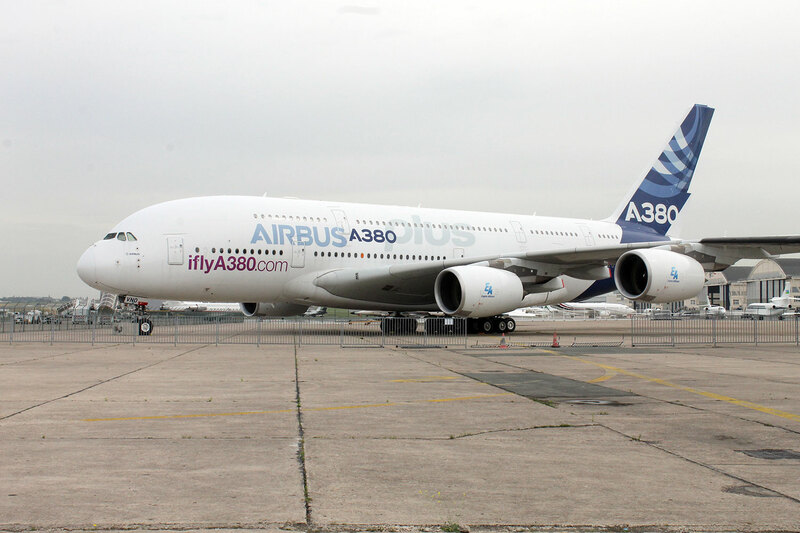 Recently arrived is an Airbus A380 prototype, F-WWDD, which had been in storage at Toulouse for a number of years. It is not yet open to the public. 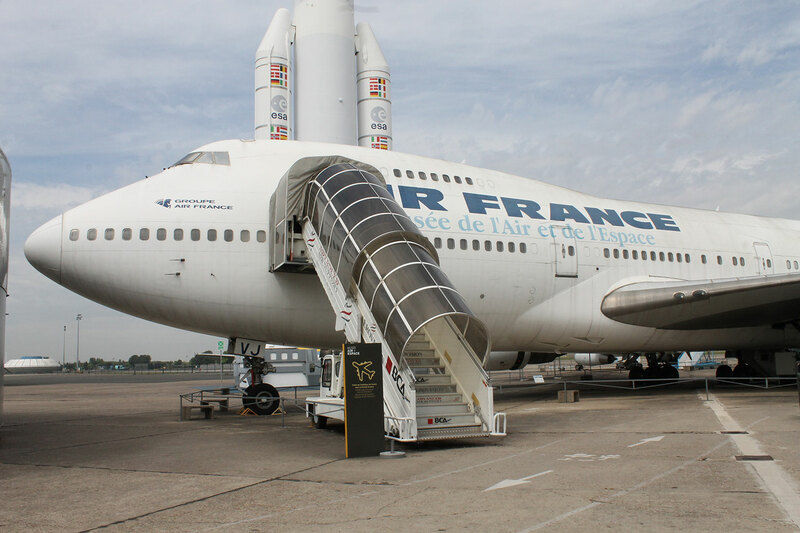 However, just outside the entrance building and thus completing the tour, is Air France Boeing 747-128 F-BPVJ which is open to inspect. Inside much of the interior is in place, showing the economy and first class seating employed by the airline at the time of its retirement in the early 1990s. Upstairs is the cockpit and a small lounge, whilst in the centre section the floor has been removed to show the innards of the giant machine and how it all fits together. 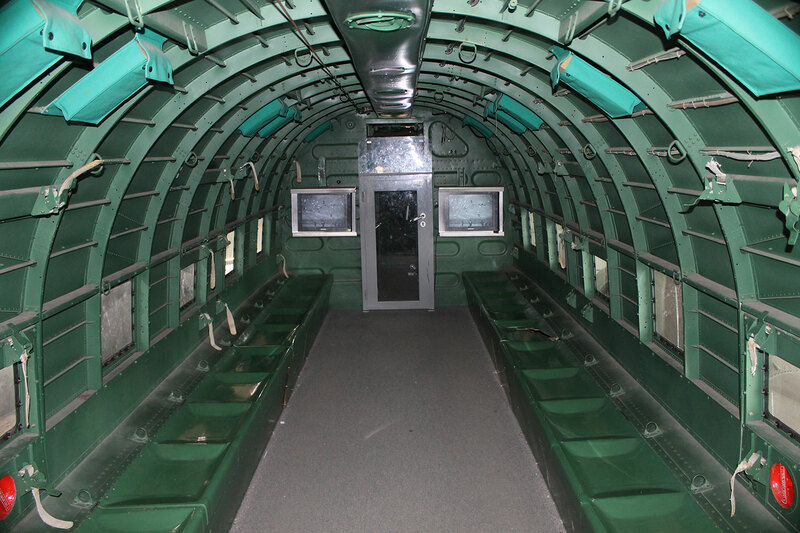 A set of stairs takes you into the under-floor cargo hold, where a small car is strapped in to demonstrate how such cargo might have been carried, and eagle-eyed visitors can spot how the passenger toilets are plumbed in. 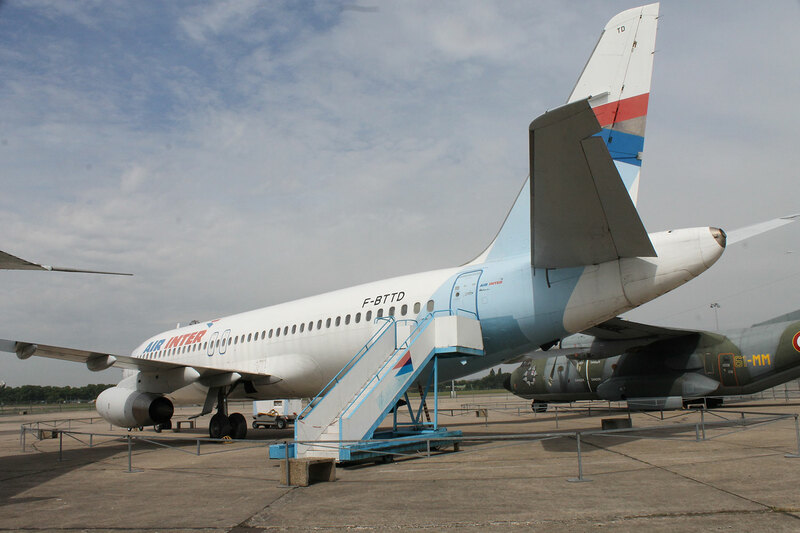 Other large aircraft owned by the museum are currently parked at a remote part of Le Bourget, but can be seen from the outside compound. 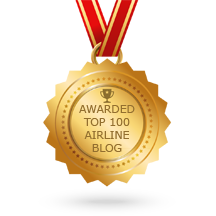 These include Air France Boeing 707 F-BLCD, Air Provence Caravelle F-GCVL, and FedEx Express Boeing 727-22F N166FE. I assume these will one day take up residence in the outdoor area. 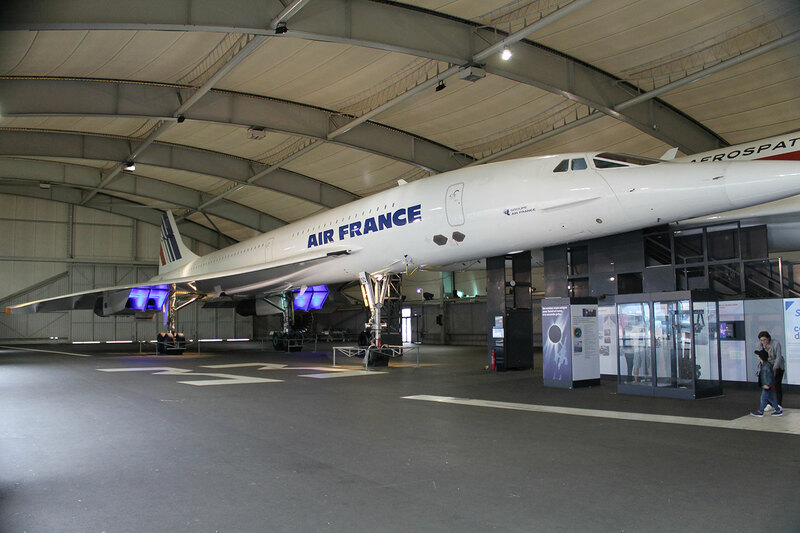 I spent around two hours exploring the museum and enjoyed it very much – especially the aircraft I was able to enter inside. To do this, you must purchase an additional ticket when you pay for admission, but it was not expensive. A souvenir shop at the entrance has plenty of models and books (mostly in French). 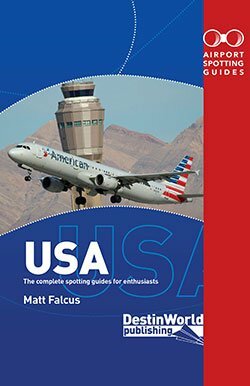 between 10am and 5pm from October 1st to March 31th. Closed December 25th and January 1st. Take the RER train (stations at Terminal 2 and Terminal 3) to the Le Bourget stop. From there it’s a 25 minute walk up Avenue de la Division Leclerc, or take bus 152 for seven stops. Alternatively, take the 350 bus direct from the bus station near Terminal 3 direct to the museum, which takes around 50 minutes. 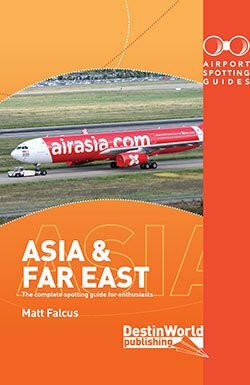 Airport Spotting Blog © 2016 Destinworld Publishing Ltd. All Rights Reserved. As an Amazon Associate I earn from qualifying purchases.